GLEN Rice Jr. appeared to have totally burned his bridges with TnT Katropa. Following his controversial ejection that cost the Katropa Game Four of their PBA Governors Cup semifinals series against Barangay Ginebra, the talented but ill-tempered import left the country on Tuesday without talking to any team official. SPIN.ph learned about this from a high-ranking team official, who refused to be named so as not to fan an already volatile situation that saw the organization imposing a huge $10,000 fine on the 26-year-old Rice. The only communication management got from the son of NBA great Glenn Rice following the incident was through assistant team manager Magnum Membrere, who the import notified about his intention to return to the U.S. the soonest possible time. “Ang sinabi lang daw, ‘I’m going home, I’m going home,'” the same official said. “His behavior adversely affected not only the team’s image but the brand and corporate reputation of the PLDT Group as well,” said the team in a statement texted to different media outfits. “Since he already left, the fine was relayed through his agent since may salary pa siyang naiwan sa amin,” said TnT team manager Virgil Villavicencio. “It is what it is,” Villavicencio quoted Rice’s agent as saying. Rice snapped late in the first quarter of Sunday’s Game Four after being whistled for a flagrant foul penalty 1 for shoving Ginebra rookie Kevin Ferrer on the neck, followed by a technical foul for throwing the ball at the fallen 6-foot-4 forward for an outright ejection. 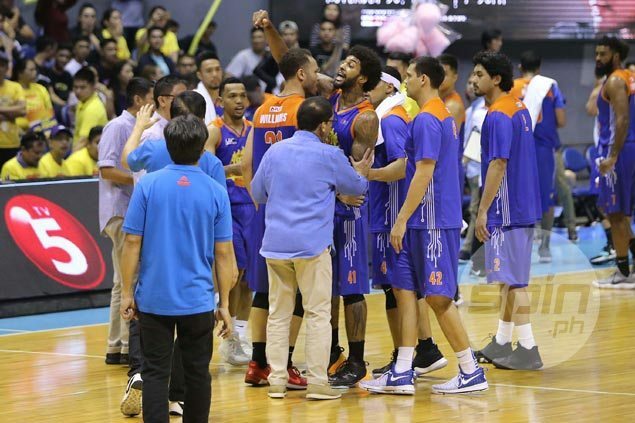 TnT teammates had a hard time pacifying the volatile import, who was also seen having some word with amiable team alternate governor Patrick Gregorio while he was being calmed on the bench. While on his way out of the playing court, Rice also flashed obscene gestures at and had some choice words for Barangay Ginebra fans. The infractions led the Commissioner’s Office to mete out a P26,000 fine on Rice, who was a replacement for Michael Craig early in the eliminations of the season-ending meet. Without Rice on the floor, TnT failed to sustain its run and lost grip of an 18-point third quarter lead that led to a 115-105 loss and bow out of the best-of-five series, 3-1.